For the mill owner dependent on the flow of water to power his mill, the mill pond was an important feature for the storage and regulation of the flow of his water. A mill would not operate satisfactorily on a small river like the Dean because of the variability of the volume of water in the river. If you observe our river you will notice that the level increases sharply after a heavy shower of rain and then declines once the runoff has been carried away. The basic flow of water changes with the seasons, more in the winter, less in the summer, very little in a dry summer. The mill required a constant flow of a minimum quantity during working hours and then nothing for the rest of the time. The only way to ensure this was to store water in a mill pond when the mill was closed and release this water to the water wheel during working hours. The mill highest up the river was limited to the amount of water stored in its own mill pond. Those further downstream benefited by having their mill ponds topped up during the working day by the water coming down from the mills above! The down side to this advantage was that after the end of the working day there would be less water in the river to fill your pond until the ponds above you were filled and overflowing. 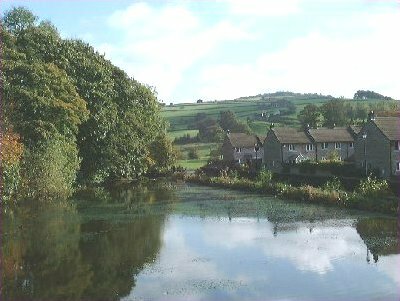 There are still several ponds to be seen along the river Dean through Rainow and Bollington, though all are not obvious and don’t necessarily contain water! The highest two are up near Rainow village – a small pond, now dry, adjacent to Cow Lane mill, and a bigger mill pond adjacent to where Hough-hole mill (the White Shop) used to be. This is now in water. Above the waterfall at the top end of Ingersley Vale is Ingersley Clough pool which provided water for Ingersley Vale or Clough mill. This is visible from the public footpaths either side of it. It is very badly silted up and is no longer of any value for water storage. The site is now privately owned and being managed as a wildlife reserve. Next, downstream, is the site of the mill pond for Rainow mill. This is part of the rough piece of ground between Rainow mill (the green corrugated building) and Ingersley Clough mill. The pond seems to have been filled with demolition rubble many decades ago. At the town end of Ingersley Vale we still have Higher mills pond, in water. What we have today is only about two thirds of the original pond. Part was used to build Dyers Close. There was then a pond for Lower mills. It was situated to the left of the river as you look at the mill from Lord Street, where the staff car park is today. It extended to the houses in Park Street. Only a small part of this pond remains today. On the Harrop brook (between Shrigley Road and Ingersley Road) there remains Oak Bank mill pond (pictured above). This is in quite good condition, having been dredged some years ago. It is also now in private ownership. The next one may surprise you – Pool Bank car park was once a mill pond! This supplied Defiance mill and the Bobbin mill that stood next to it on what is today called Queen Street (left). So far as I know the corn mill at West Bollington did not have a pond; it used a very long leat that came off the river, probably close to where the war memorial is today – the river ran across there before the canal was built – and is visible today only in the Recreation Ground – the small foot bridge by the tunnel was an aqueduct for the leat and the watercourse followed where the path is today. 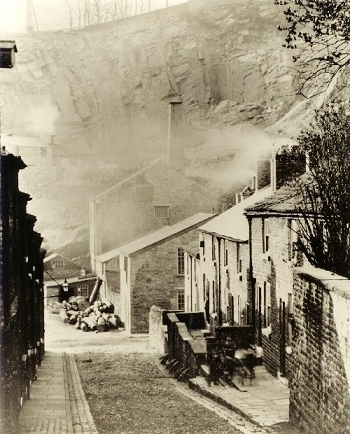 It then went out into the street and all along the side of Wellington Road, mostly in an underground culvert, to the mill just beyond Garden Street. Waterhouse mill had a very large waterwheel and this was fed from a pond which was in the higher part of the site where the Co-op shop is today. This was fed from the river Dean – you can still see the start of the leat in the Recreation Ground immediately above the weir. Originally it may well have extended across where the Middlewood Way viaduct is today. However, this would have been filled in by the late 1860s when the viaduct was constructed. See the Waterhouse mill page for a picture taken before construction of the viaduct, and for pictures of the wheel pit taken during its demolition. The last big pond, heading downstream, is that above Lowerhouse mill. This is filled from the river Dean at the back of Calder Close and fed the waterwheel that originally powered the mill from 1819. This pond remains in water. Clarence mill has a pond in the fields above the mill but this was to provide water for steam engines, not water wheels. In a similar way, Adelphi mill used water from the canal to fill its boilers. There is a medium sized pond in Ingersley park, which remains in water but out of public sight. I have no evidence that this was used by any mill. It’s on a very small watercourse, the Lima brook, running into the Harrop brook just above Oak Bank pond, so continuity of supply would have been a problem, and there were no mills in that area. It’s probable that this was an ornamental lake with no industrial purpose.